The second lesson of the Let’s Face It course was about drawing inspiration from different sources and the tutor was Kara Bullock. I settled on an orange and green colour palette for my response to the lesson since neither is a colour I use as a “go to” and I have rarely used them in combination. I probably could and should have gone for something much more daring but orange and green was sufficiently outside of my comfort zone. I was going to make the hair orange but decided that was too normal and switched so that orange was the background and accent colour and green was the hair framing the face. 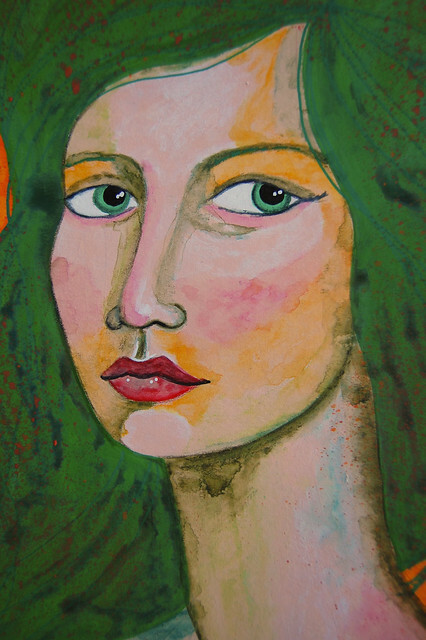 Ultimately, I do not like how the hair turned out – partly because I had problems layering Neocolor II and ink on top of an acrylic base – and I wish I had gone with my first instinct to paint orange Pre-Raphaelite hair. I did not use a photographic reference for my painting and interestingly ended up with a long face and long neck again. That seems to be what I want to draw at present. It will be interesting to see how that develops or changes as a result of undertaking this course. Ha ha! Thank you. I seem to be on a kick with long necks and Rossetti hair. It helps that it means I can avoid drawing ears. I think she looks great, including her hair! 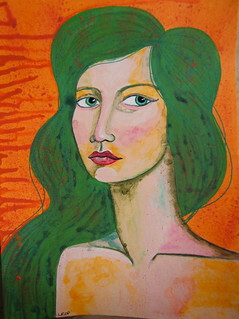 I like her pose, her long voluminous hair especially the texture you have created with combining neocolor and ink with acrylic, and that orange background with its drips and splatters. Your page made me realize that orange and green is a great palette. Thank you very much. Unfortunately the neocolor and ink pooled a bit in the hair so I didn’t achieve the texture I was aiming for. We live and learn though. I’ve certainly learned to be more adventurous with colour combinations. From the photo, it seems the pooling was minimal creating the texture I am seeing. Though, I know how you feel when you shared what happened to it. We want something but sometimes many things cooperate preventing our plans. yes, we live and learn.